In our clinic, we liked to use the Math tests on the WIAT-III because that test separately looks at speed of math facts retrieval, math reasoning (through orally presented word problems), and what the test called ‘Numerical Operations’ – an untimed test that presents math problems that start at Arithmetic and end at a little Calculus. What the latter test is good at is allowing a tester to look for math-gifted dyscalculics (not as uncommon as you might think) – these are students who can do math quite well, but are slow at basic math facts. Sometimes we have seen pre-engineering dyslexic dyscalculic students spend several hours at this subtest – showing their advanced mathematical thinking..although these struggled retrieving their math facts quickly. One limitation of these tests, though, is that while discrepancies are easy to identify (for instance, strong at math reasoning, although slow at math facts retrieval), the tests are not designed to select out more specific factors that could indicate more detail about the source of math difficulties. The Feifer Assessment of Mathematics was an attempt to provide more detailed information about the source of math difficulties. There are some valuable insights that can be gained, but also significant limitations that will probably prevent its wider adoption at the present time. A somewhat critical review of FAM was offered by a school psychologist HERE. The lack of specific age norm is clearly a significant weakness, and compared to the more established standardized tests, it has not undergone rigorous outside confirmation. For practical purposes such as obtaining accommodations from the College Board or ACT, it is not an as yet accepted test…probably for the reasons mentioned. Nevertheless, the test results can be helpful in helping students identify why they’re having troubles in math. Many of the tests are quite similar subtests that can be found in other standardized tests – but the organization of the test outputs results in specific categories such as a procedural index, verbal index, and semantic index. What I especially liked is the list of behavioral observations during math work that testers were supposed to note – like whether finger counting was used or whether the student sacrificed speed for accuracy or accuracy for speed. Although WIAT-III test administration didn’t require a detail analysis of math errors, we always found it valuable observing how students answered questions as well as trying to determine why they were getting questions wrong. We believe valuable data could be obtained administering such a test – it just is not, at the present time, sufficient to take the place of more established tests – especially for obtaining accommodations for high stakes tests. Hopefully the next generation of tests may also offer more matching of test results and tailored learning recommendations. Learn more about the Feifer test HERE. 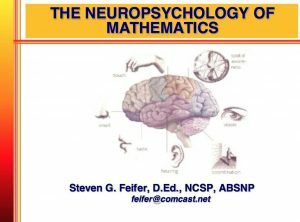 Check out Feifer’s presentation on the Neuropsychology of Math by clicking the image.